OpenIDEO NYC Chapter is a community that aims to trigger and nurture collaboration between passionate design thinkers and mindful social innovators in order to tackle complex social issues. In May and June 2016 we organized, two workshops (research and ideation) for the End of Life Challenge. Lee Kim joined us for the second workshop: it was her first time participating to an OpenIDEO NYC Chapter meetup, but not the last time - far from this! During the whole summer 2016, she took the lead to running prototyping workshops in NY (our co-organizers Bettina Fliegel attended many of them). After the summer, the story continued and it's not finished! We wanted to share with you Lee's experience and tell you more about this inspiring impact story. On one summer evening in 2016, I made a trip to NYU’s downtown Brooklyn campus to attend my first OpenIDEO NY Chapter meetup. I didn’t know whom I was going to meet, what I was going to work on, or what this meeting was all about. All I knew was this meetup was about application of design thinking methodology to reimagine the end of life care. It was an ideation night. We created imaginary personas for “the end of life” project. The meeting was short, but at the end of the night, I couldn’t wait to get to the next phase- prototyping. Over the next two months, I participated in the empathy interviews, led several prototyping sessions, and three testing sessions at Mt. Sinai’s palliative care unit. OpenIDEO NY Chapter team’s submission made to the final stage, but unfortunately didn’t get selected as one of the winning projects. What a wonderful summer it was! We met almost every week to build and test and to connect with each other. It was also the first time I got to work with those who are dealing with “the end of life” – doctors, nurses, and caregivers. I felt the need to stay connected to those who are working in this space. So I wrote an email to Dr. Sarah Norris who came to that first ideation night meetup and became one of the users for the prototypes we designed. I expressed my sincere desire to stay connected to her world and find ways to bring value to the work she was doing. In March 2017, with Dr. Norris’ input and assistance, I was able to conduct empathy interviews with three patients who were at different stages of their chemo therapy. One of them passed away three weeks after our conversation. I still remember the chair she was sitting in and her father who was sitting across from her. Our journey through “Reimagining the end of life care” was not a straight path. There were so many unknowns, so many tears, so many frustrated days, but all along, Dr. Norris and I learned to embrace the nature of the wicked problems that we were dealing with. We learned to pivot. We learned to trust on each other’s intentions and desire to bring empathy and care to the path that we are uncovering and also paving. Towards the end of the year, we held two workshops at The Children’s Hospital At Montefiore (CHAM) to share stories and to define the users for whom we want to design the experiences. About twelve participants consisting of physicians, nurses, social workers, and caregivers participated in these workshops. We cried. We laughed. We connected with each other at a deeply personal way. As we open the story book for CHAM 2018, I am truly excited about the unknown road we will be traveling and the collaborative spirit that we have built together. Yesterday, we had a terrible rainy day with phone alerts for flood. We thought that the chances to have a few people joining us on a Friday after work from 5:30 to 7:30 on such a rainy grey day was really low. But we had planned to meet for a Refinement pop up to support 3 ideas posted by members of the OpenIDEO NYC chapter which are now in the Refinement Phase in the Fall Prevention Challenge. So we went and we ended up being 15 people, all willing to help and share ideas. The atmosphere was informal and friendly and the feedback constructive, and we even had a surprise. Bettina would love to speak with a physical therapist and a landscape architect. She has some ideas on how to explain the idea visually but would love to work with someone who could help her do that. Joy is particularly looking to get feedback on UI/UX of the app and overall thoughts of the viability and scalability of it. They would particularly need advice from an industrial designer on making sure that the design is balanced. Getting feedback on the business model might be also useful. Despite the last minute nature of the event (we discussed the idea last weekend and finalized the date on Monday), we had a nice group of about 15 people joining us for this informal workshop. Bettina, Rodney and Dawn and Joy presented their ideas and, showed us their latest prototypes. The group asked questions, made suggestions and all offered to help further. For example, Tuba and Manjunath will go soon with Bettina to do more user testing in a park suggested by Daniel. where we will mix brainstorming, user testing and prototyping. Dawn and Rodney made a call to collect old shoes as they want to use the soles for their next prototypes. At the end of the workshop, they already had 3 pairs! Joy ended up with some suggestions on how to present best the idea using an experience journey and / or a user-scenario, and all participants willing to provide further feedback on the next iteration of the user interface. 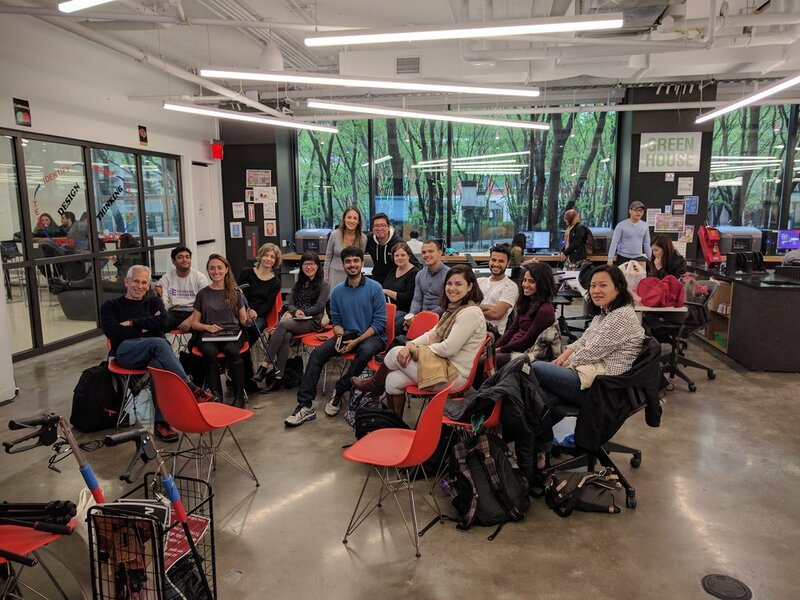 Yesterday was not only an example of the collaborative culture of the OpenIDEO NYC Chapter but also a great example of the collaborative power of OpenIDEO and the OpenIDEO chapters. Imagine our surprise when 30 minutes into the workshop, two members of the OpenIDEO Lima Chapter, Madeleine Delgado and Freddy Shimabukuro joined us! They had just arrived in NY and are coming for the THINK Conference, a national conference organized by COOP Financial Services were some of the top ideas of the Financial Longevity Challenge will be presenting. Adhshi Patel, a DFA NYU member and a member of OpenIDEO NYC Chapter, who will also be presenting with his team at the THINK Conference was also there! Madeleine and Freddy will be presenting Friendly ATM Adhish and his team will be presenting Build Your Business (Originally Incubator Club). There are days like that, where you are glad you took the time to come out despite the rain and all the other events you could attend, or the things you have to do! And yesterday was one of these days! Good luck to Bettina, Joy, Rodney and Dawn as they continue refining their ideas! Congratulations again to Adhish, Madeleine and Freddy and their respective teams.